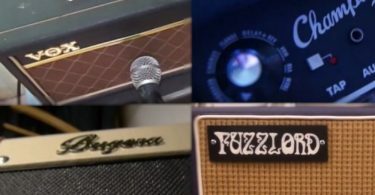 Best Electric Guitar Amps Reviews: Top-5 in April 2019! Most experienced guitar players regard an electric guitar amp as the most important playing tool of all, because among all factors that determine the tone of an electric guitar, it’s the major source. There is a limit to how loud your electric guitar can play, even those with a hollow body cannot give you the sort of loudness you desire without some help of some sound augmented tool; say the electric guitar amplifier. No doubt guitar amp is advantageous during musical performance, as it serve as the power-house of your entire sound setup allowing you to easily turn your ordinary guitar current into clear crisp sounds. 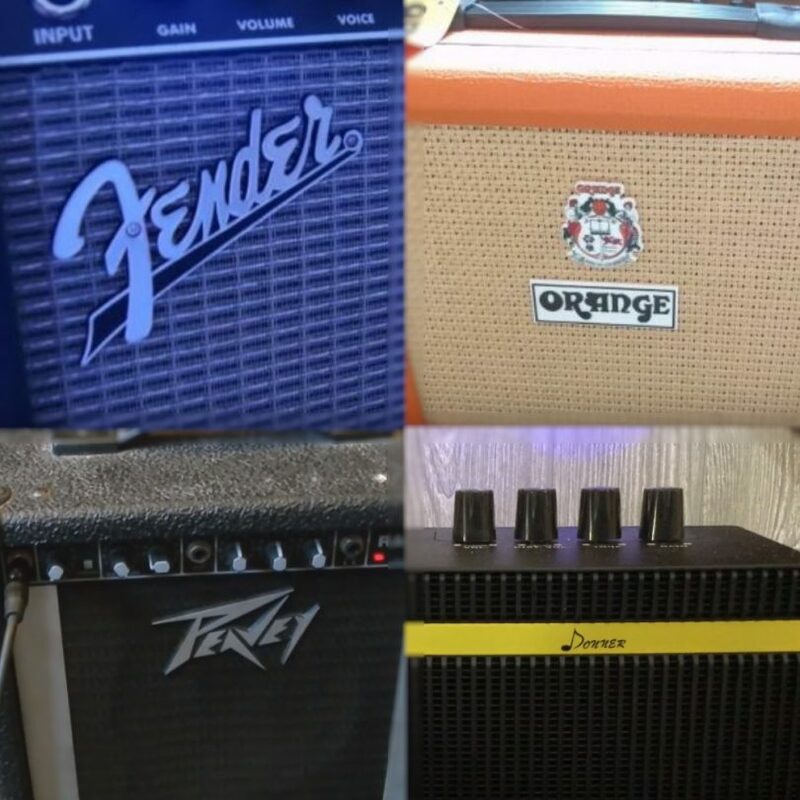 Guitar amps come in various shapes, types, and sizes, all of which have different specifications and uses. We have taken time to review some of the best and affordable electric amplifiers you can find out there, and we are totally sure it will help guitar players make the right choice. 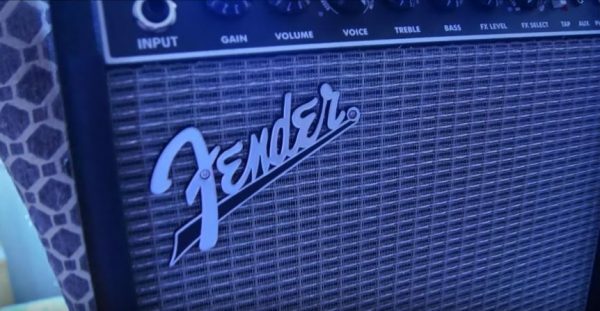 Fender as a musical instrument brand has been in the market since 1946, and one of its popular tools is the Fender Champion 20-watt electric guitar amp. This is a top amp with features that are rarely seen in amps of its price range. While most of the amplifiers less than $100 are 10-watt amps, this one delivers up to 20 watts of purely impressive sound. It also comes with board effects and amp modelling as well as an EQ section which allows you to add-in exceptional effects to your sound conveniently. Auxiliary input for plugging in your MP3 player. 1/8th headphone output jack allows you to plug in your headphone for silent playing. Open back cabinet provides storage space for extra cables and other small accessories. Bass and Treble EQ for shaping the sound to your preference and for adding effects. One of the most stand- features is its amp voicing. You get four dial tones with this amp categorized into Metal, British, Blackface, and Tweed. You can dial through these individual zones and boost any particular voice of your choice giving you a 12-amp voice range. You can also shuffle between mean and clean tones with just a turn of a knob, thus allowing you to conveniently accommodate all genre of music on its various 17 amp models. 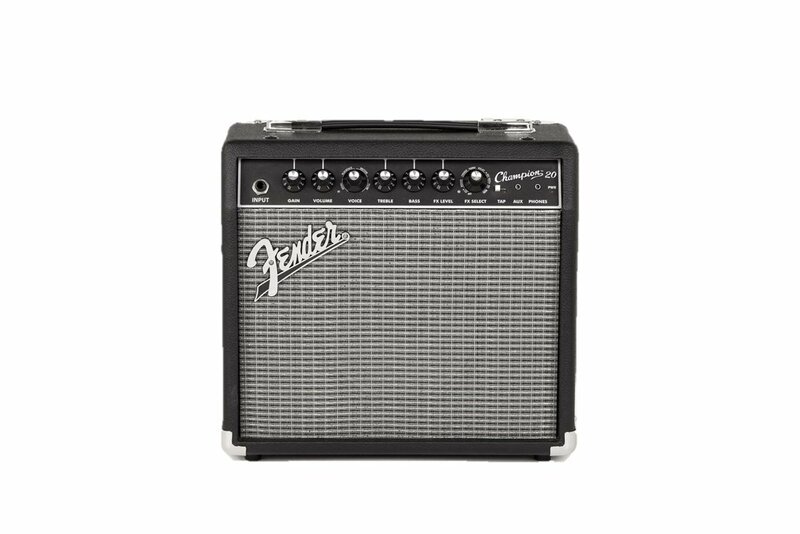 An ideal option for your first practice amp. Light-weighted Straightforward control & a special button called “tap button” strictly used to alter the delay or speed. Easy to use and versatile for enough for blues, jazz, rock and more.. 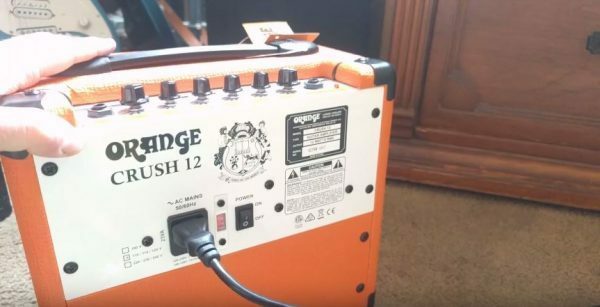 The Orange crush 12 is an affordable and highly functional electric guitar amp. 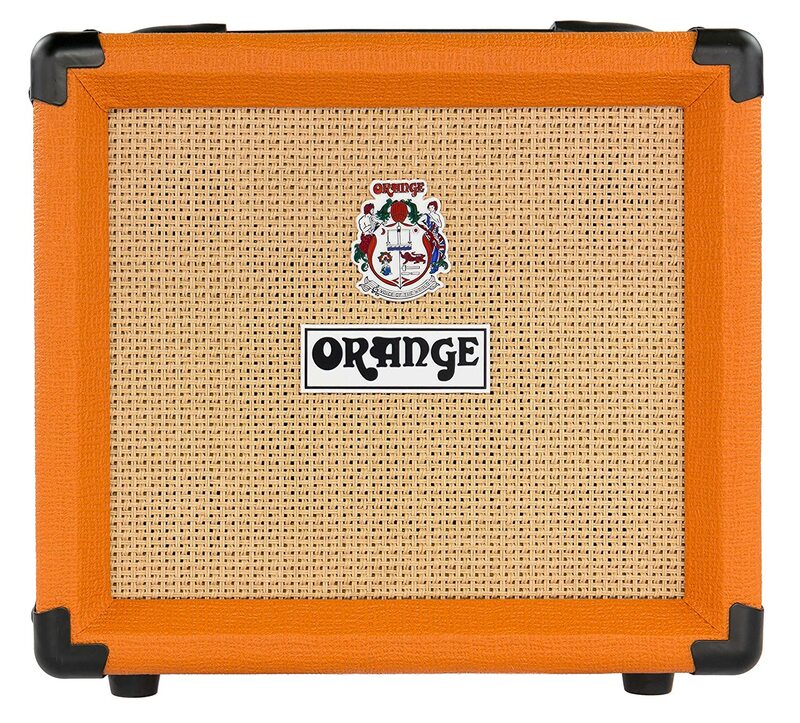 Sporting the trademark orange look, a basket weave Tolex with a woven speaker grille, this portable amp comes with a 6” speaker that can mimic the sound quality of high-quality full-sized stacks. It has a Dual gain controls. It has a 3-band EQ.. 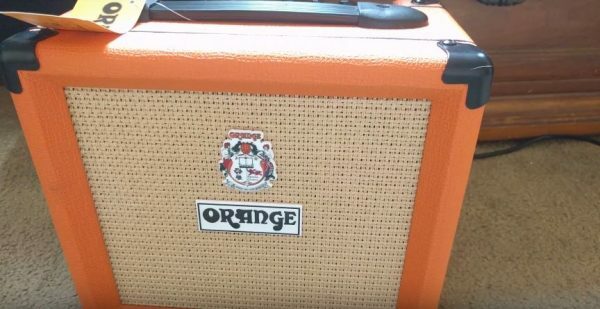 This is perhaps the loudest 12watt amp you will definitely find out there. Despite its diminutive size, you can expect pretty much the same performance you would from a full-sized orange amplifier. In addition to the usual knobs for controlling the gains and volume, you also get a 3-Band EQ as well as overdrive controls. It also features a CabSim-loaded headphone output port which allows you to attain huge tones even with quiet playing level. 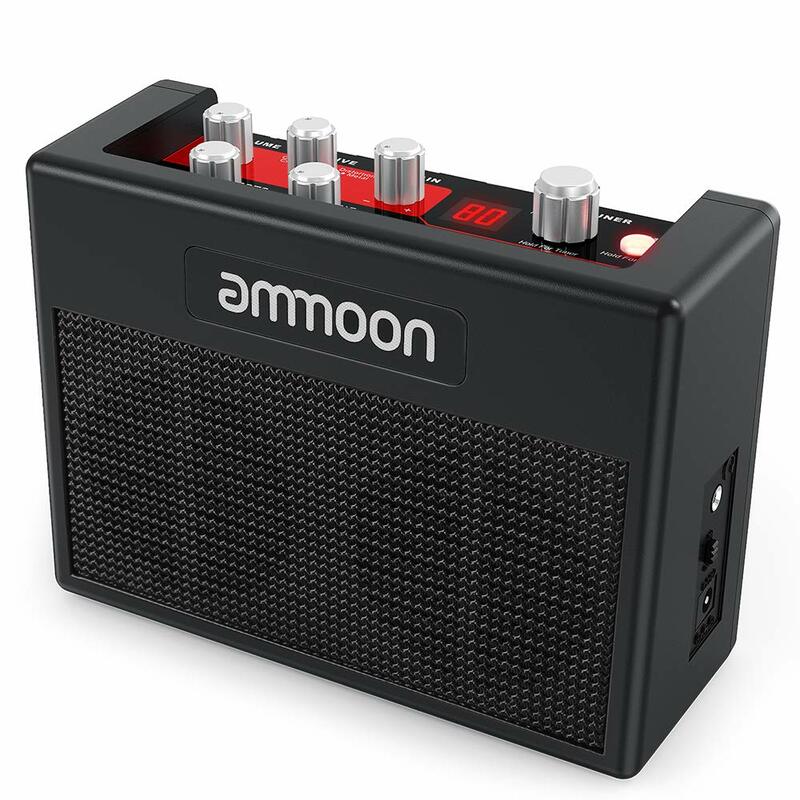 A great little practice amp that can be used with effects or peddles. It has an headphone jack so you won’t disturb neighbours or other family members while practicing. It doesn’t suit an outdoor or stage event. 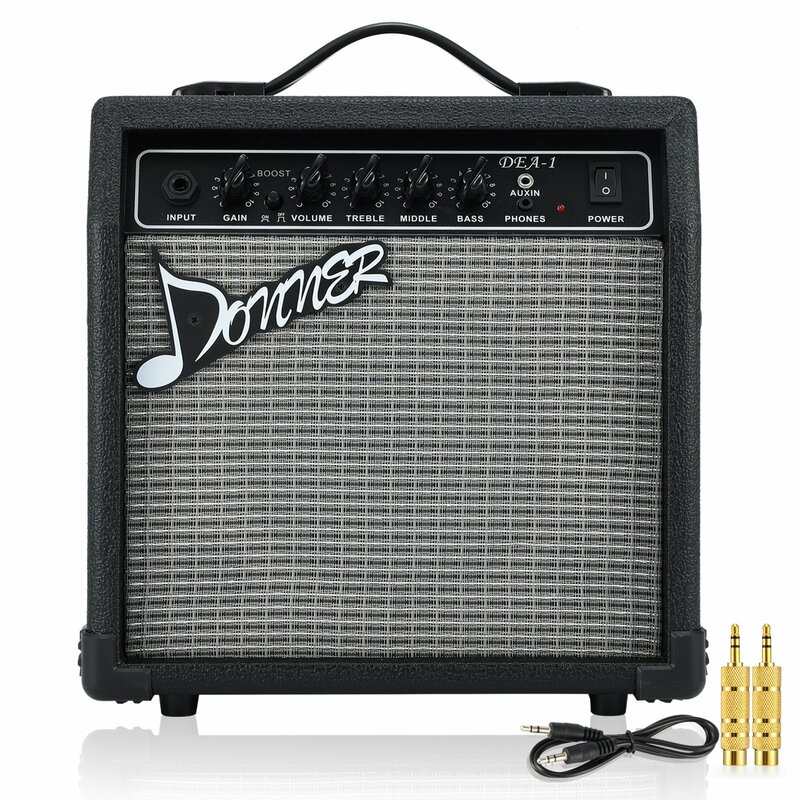 The Donner electric guitar amp is a powerful 10-Watt Electric Guitar Amplifier which delivers an explosive tone and features simple and intuitive controls which makes it suitable for beginners who want it for private practice purposes at home or small gatherings. For just $55, this classical guitar amp is value for your money. Protected edges prevent damage and keep the app safe and stable. With the Donner Electric guitar amp, you get two channels both of which deliver exceptional quality sound. The clean channel operates just like a normal amp does; however, you can add an explosive volume with the booster channel which produces as much sound as a 15W amplifier. It comes with a 3-band equalizer which is the treble, middle and bass control that allows you to shape the guitar tone to your preferences. There is also a headphone line output which allows you to play silently. The 3.5mm Line in socket also makes it possible to connect an external audio source and play along. Can be used with a harmonica mic and also android phone to stream music. Perfect adjustable knobs for fine-tuning the sound. This compact and lightweight guitar amplifier comes equipped with two 3 inch speakers that can deliver pure tones and a powerful sound great for practice purposes or small performances and Karaoke. It comes with a dual power supply option you can either plug it into a 9V DC power source directly or use 6 AA batteries instead. Gain controls determine how hard the amp is being driven by your guitar while the volume control can be used to determine how loud your amp plays. 1/8″ headphone output jack is for connecting headphone for silent practice. This guitar amp features 80 in-built drum rhythms with an adjustable tap tempo you can play along to; you also get to choose between 4 drive models. You can switch between, Metal, Distortion, Overdrive or Clean channels quite conveniently. You can also create your guitar tones by making use of the 3 DSP effects; reverb, tremolo or chorus. You also don’t have to worry about playing in tune since this amp comes with an inbuilt tuner. Provides through tones and fantastic sound. You might not get much from the distortion and metal settings. 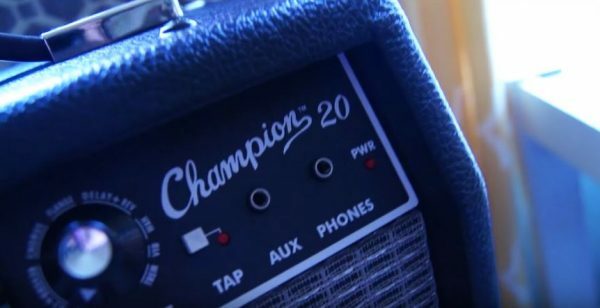 The unique feature of this guitar amp is its TransTube Preamp which helps it to deliver a highly realistic amp tone with dynamic response rarely seen in amps of the same size and grade. It allows it to emulate the sound of a tube amp and still retain the reliability and convenience of your regular solid-state amp. 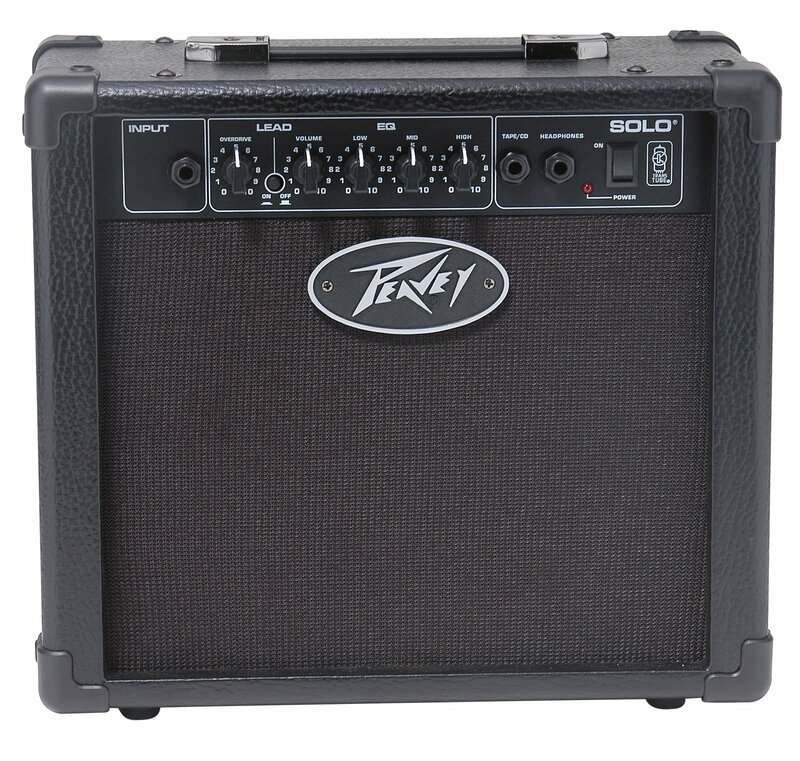 This 12W solo guitar amp features a master volume control as well as a separate lead control that allows you to color your sound according to your preferences. There is also a channel switch to seamlessly move from clean chunking rhythm to loud lead in just an instant. The three band EQ also helps to further tweak the tone for professional grade sound. The amp also features a 1/4″ inch stereo input for connecting an external player and has a headphone jack input as well. Ok! All the amps listed have a special place in the history of “quality sound and affordability” and the concept here is subjective to the ears of the player. While this at least is by no means exhaustive, it’s highly difficult to declare that a particular amp sounds or is simply preferable to the other, this is because there are other factors to consider. Note that the amps featured on this list are mostly for home practice and simple outdoor events and they have features that fit this particular special purpose. So, Enjoy!